CLICK HERE to WATCH Shirley Levi Headlining at The Viper Room - Video Excerpts caught on fans iPhones! CLICK HERE to check out Shirley Levi at The Viper Room event on KCRW's website! CLICK HERE to READ concert REVIEWS from Shirley Levi's last performance at Bar Lubitsch! For the first time ever, Shirley Levi shares her spontaneous live recordings of some of her new songs via ReverbNation to her fans! These are some quick, one-take wonders of brand new songs which Shirley Levi will be taking into the studio and producing for her next album! Also featured is her previous album "Break Free", which is for sale on iTunes and includes personal remixes by Shirley Levi, AKA: DJ SFL. (All songs Written, Produced, Performed & Remixed by Shirley Levi). JOIN the Shirley RAWk Revolution!! SHIRLEY LEVI'S BEEN FEATURE ON RADIO STATIONS AROUND THE WORLD! SEE all of Shirley Levi's RADIO PLAY! DOWNLOAD the album "Break Free" on iTunes HERE! DOWNLOAD Shirley Levi's "Your Eyes" Compilation on iTunes here!! FOR FILM, TV, GAMES & MORE! Exciting new music from recording artist, producer and remixer Shirley Levi is now available for tv, film and commercial placement. Shirley Levi's writes in a variety of different styles including Pop, Rock, Folk, Electronic/Dance, Adult Contemporary, Country/Roots and World Music. Her versatility and diversity makes her music perfect for tv, film, commercials, animation, videos, and theatre productions. Shirley Levi Publishing is offering special clients in television and film a first listen only on this site and offering the following licenses: Mechanical License, Synchronization License, Sample Clearance License, Master Use License. If you are a Music Supervisor for Film, TV or other media, request you username & password to gain access to Shirley Levi's NEW MUSIC LIBRARY! I'm soooo proud & deeply honored to have been asked to sign all of my hero, Neil Young's guitars, when I played at his 29th Annual Bridge School Benefit!! Look for signatures on the guitar as well by Neil Young + Promise Of The Real (With Willy Nelson's boys), Peggy Young, Dixie Chicks, Sheryl Crow, Ben Harper, Ryan Adams, St. Vincent, Gary Clark, Jr., Spoon, Nils Lofgren. These are some quick, one-take wonders of brand new songs which Shirley Levi will be taking into the studio and producing for her next album! Devine Evans has been a dominant figure in the music industry for over 20 years. He is a five-time Grammy Award winning songwriter, producer, and music programmer. Shirley Levi contributed her story and gives advice in Chapter 18 of the book and her vocals are featured on the accompanying Sound Track! Pre-Order The Book & Sound Track Here! READ the Guitar Girl Magazine interview here! Shirley Levi is a self-taught American Rock Singer, Songwriter, Producer & Activist. Her music is a rhythm based, guitar-driven style with soulful yet edgy vocals and unforgettable melodies. She artfully joins her Rock music with Pop, Country, Folk, Blues and World Music in what she calls Shirley RAWk. Shirley Levi is a rebel with a cause, writing freedom-fighting anthems with major punk rock attitude. Her lyrics reflect her undying commitment to making positive change in the world and are filled with timeless messages of unity, compassion and determination. Her music is greatly influenced by music from the 60's and 70's, but with a unique, modern feel, which has earned her endorsements from Gibson Guitars and Marshall Amps. 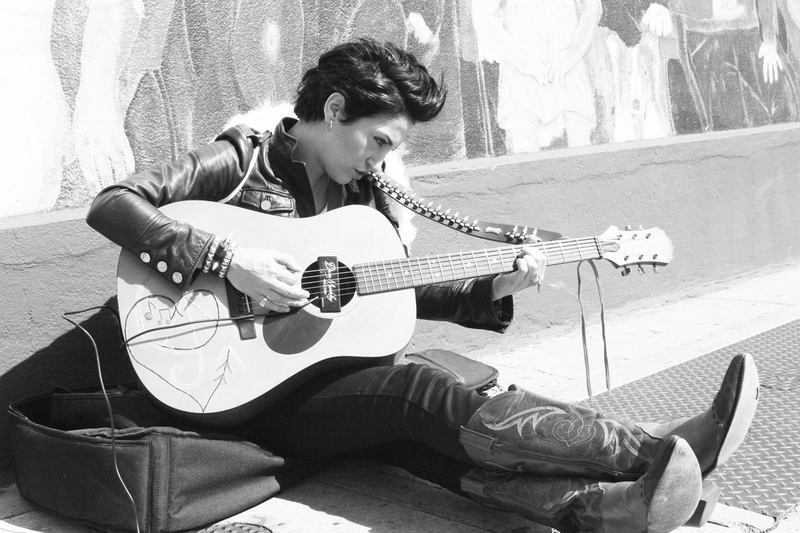 Shirley has come a long way from playing the main stages at Hollywood’s most iconic music venues such as Avalon, Saban Theatre, Viper Room, House of Blues, etc…to open for musical legends like Neil Young, Sheryl Crow, The Dixie Chicks, Ben Harper, Ryan Adams & Spoon. She is known for her passionate, dynamic and powerful stage presence. Although she’s recognized for her ‘Do It Yourself’ way of writing, producing and remixing all of her music, she occasionally works with acclaimed producers such as Fernando Garibay (Lady Gaga, Enrique Iglesias and Madonna), 5x grammy winning producer/sound engineer, Devine Evans (Justin Timberlake, Nicki Minaj, Mary J Blige, Chris Brown, Britney, Rihanna, Kanye West, Drake, Jay-Z, JLO, and many others) and legendary hitmaker Val Garay, whom has garnered over 100 Gold & Platinum Records (Neil Young, Elton John, Ringo Starr, The Rolling Stones, Dolly Parton, James Taylor, Linda Rodstadt, Seals & Croft, Kim Carnes and many more legendary acts) and whose albums have sold over 200,000,000 copies worldwide. Shirley is also collaborating with hitmaker Jesse Barish, whom wrote chart-topping songs for artists like Jefferson Starship and Marty Balin. VIEW Shirley Levi's entire BIO!! "She writes, sings and performs her own music in addition to owning her own record label, Re-Bel Visionary Music because, unlike so many artists waiting for their big break, Levi does not sit idly by waiting for opportunity"
"I listened and it got me right away!" "Her music will make you forget about the monotony of the everyday, much like biting down on a power line. Shirley is a frenetic angel with a sinful swagger and beatific aura that both tranquilizes and terrorizes (as all great music does!)... Her lyricism invoked Bob Dylan during his late electric period, but blended with the visceral emotion of Lou Reed." "Shirley Levi is a proactive indie sensation who's on the cusp of taking the world by storm!" READ all of Shirley Levi's Reviews! WATCH, READ & LISTEN to all of Shirley Levi's ACTIVISM videos & interviews! CLICK HERE to WATCH Shirley Levi once again on the Miracle Mile outside of The Oprah Winfrey Neywork in support of Autism Awareness, Hunger Relief & Equality!! CLICK HERE to LISTEN to Shirley Levi's passionate interview on ICAA Talk Radio. "Shirley has to be my favorite guest of all time now." - Emily Malabey, ICAA Talk Radio. CLICK HERE to WATCH Shirley Levi's special acoustic performance & interview with Patricia Arbulu for Autism Awareness on Azteca America's top-rated show "Entre Nos"! Featuring her original songs "Anne Marie" & "Te Amo". Also featuring her version of "The Shmah" in Hebrew! CLICK HERE to WATCH Shirley Levi's TV INTERVIEW AND PERFORMANCE of "ANNE MARIE" on Telemundo's top morning show "De Todo Un Poco" ~ A special dedication to those with AUTISM. CLICK HERE to WATCH Shirley Levi and Los Angeles citizens support Haiti outside the Jim Henson Studios, where the remake of "We Are The World" is being recorded. CLICK HERE to WATCH behind-the-scenes footage of the radio interview featuring Shirley Levi, Recording Artist, Activist & Founder of Music On My Shoulder on Autism American Radio with Nick Geber - Sirius/XM Family Talk channel 131 - With over 35.5 Million listeners.